The Cavalier King Charles Spaniel is very popular throughout the world and now ranks as one of the most sought-after toy breeds. A closely related breed is the 'King Charles Spaniel'. The most obvious difference is a more compact facial shape, but it also has a clearly domed skull when compared with the Cavalier. The 'Cavalier King Charles' was bred to be a slightly larger size and the face shape is the main feature distinguishing the separate breeds today. 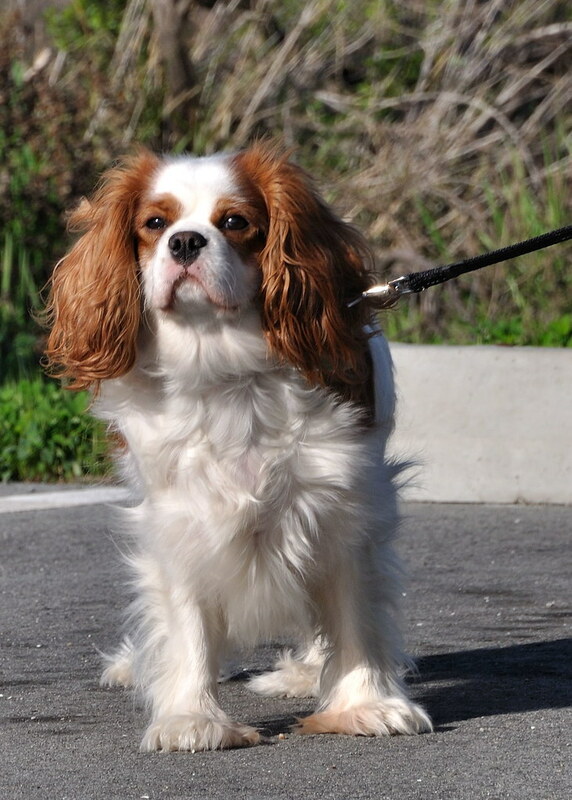 Cavaliers have a friendly personality and delights in the human company of any age. 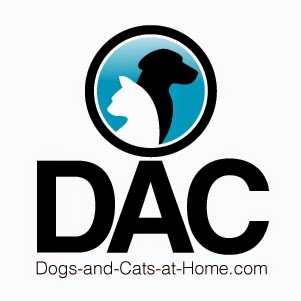 They are wonderful with children and make a loving companion for anyone at times when just wanting to sit and relax. They are not very athletic compared with larger spaniels but have a playful side to their nature, especially if they are introduced to games and play from an early age. They will also enjoy a short daily walk as their exercise routine. Cavaliers have a life expectancy of 10-12 years however the breed also has a tendency to put on weight as they can be greedy and prone to obesity. In turn, this may predispose them to diabetes and heart problems to which they are susceptible, so it is important not to let your Cavalier become overweight as this may worsen especially later in life. Whilst training your Cavalier alternatively you can use healthy options like pieces of carrot or apple instead of other food treats. Regular grooming is needed for Cavaliers to keep their flowing silky coats in good condition. A slicker brush and comb will remove any tangles through the coat. They tend to get matting or knots around and behind the ears, so this will need to be trimmed or snipped away. As Cavaliers have long ears it's important to make sure their ears are kept clean from moisture and mites. So during bathing them, you need to hold their ear down or put cotton wool in each ear to avoid getting water in the ears. The ears can be cleaned with medicated ear powder and stray hairs to be plucked away from the inside of ears. The eyes can be wiped with cotton wool that has been moistened with eye stain remover. This will also help remove stains around or under the eyes. The tips of toenails can be cut ensuring not to cut the quick. Grooming your Cavalier King Charles needs to be done every 6-8 weeks. The ears need to be checked weekly and cleaned if necessary and toenails should be checked and cut during the full grooming session. 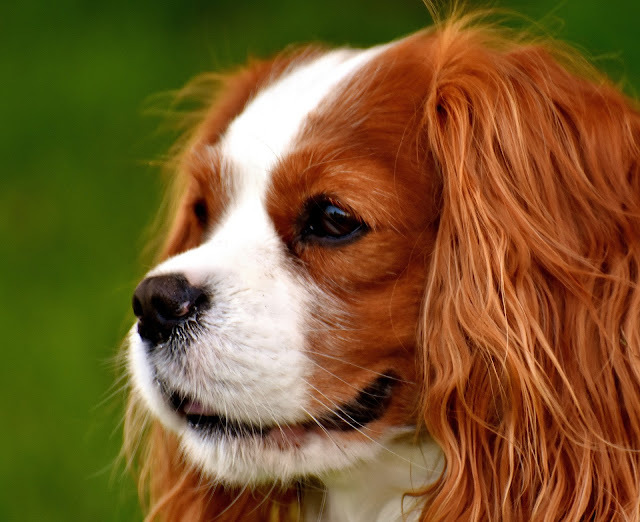 The colorings of a Cavalier King Charles are Chestnut Red and White known as 'Blenheim', known to be the original strain developed at Blenheim Palace in the 1700's. Other colors are Black and Tan, Red (known as Ruby) and also the Tri-Colour - (Black, White, and Tan). They will generally grow to about 30.5cms (12inches) height at the shoulder and an average weight of 5.5 - 8kgs (12-18lbs) when fully grown. The Cavalier King Charles makes a great family pet or a loyal loving companion to be by your side and is one of the best breeds you could ever share your life with. The Cavalier King Charles Spaniel is considered a toy dog. This dog stands 13 to 18 inches at the withers and weighs between 10 and 18 pounds. The Cavalier King Charles Spaniel has a long, silky coat with feathering on the legs, tail, and ears. The coat comes in four colors: Blenheim, ruby, tricolor, and black and tan. Although the tail of the Cavalier is usually left its natural length, it is sometimes docked by one third. This dog can have a life span of 9 to fourteen years. It is also called the Ruby Spaniel or the Blenheim Spaniel. King Charles II of England is most closely associated with the Spaniel that bears his name. Even as a child, he was surrounded by this breed of dog. After he attained the throne, he promoted the breed and allowed the little dogs the run of the palace. It is said that the Cavalier King Charles Spaniel even whelped on the royal bed. This small dog is present in art from the 16th to 18th centuries and was used to help attract fleas as well as its duties as a comforter dog. Breeding with the Pug produced a shorter faced dog, the King Charles Spaniel. However, an American fancier Roswell Eldridge, bred the breed back to the more original dog and recreated the Cavalier. The Cavalier King Charles Spaniel is exclusively a companion dog, despite its old Spaniel hunting instincts. 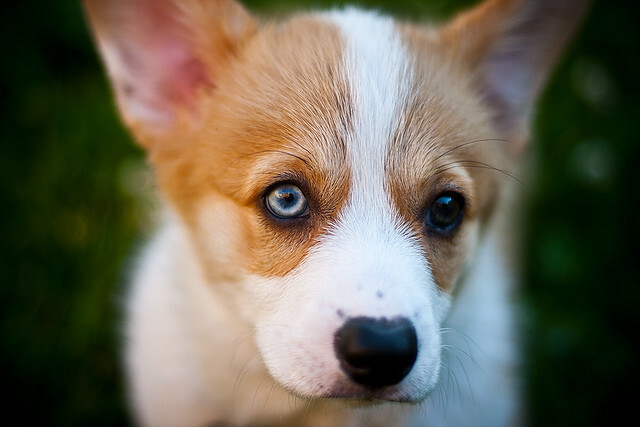 It is a very affectionate and happy little dog that thrives when given attention by its human friends. This is a very playful dog that wants to please those around it. The Cavalier King Charles Spaniel is an excellent companion for anyone and is trustworthy and gentle with children. It loves to cuddle and bonds strongly to its family. Although the Cavalier King Charles Spaniel is a fairly healthy toy breed, it can suffer from a variety of inherited health problems. One of the most serious problems is mitral valve heart disease, which begins as a heart murmur and can become worse as time goes on. Another serious condition is syringomyelia, in which cysts will form on the spinal column. This can be a painful condition for the dog. The potential owner of this engaging little dog would be well advised to make sure the dog is purchased from a reputable breeder who has followed intelligent breeding practices. Since the Cavalier King Charles Spaniel has such a long coat, it is important to keep it well groomed. The dog should be brushed every day to prevent matting and the hair on the feet should be kept trimmed, especially around the toe and foot pads. The long ears should be checked regularly and kept clean and dry to prevent infections. Pay some attention to the eyes, too, to make sure they remain infection free. The Cavalier King Charles Spaniel is a house dog. It cannot live in an outside situation, either physically or mentally. This little dog needs to be around people as much of the time as possible. The dog will adapt its exercise needs to its owner, so it is suitable for both active and inactive lifestyles. Regardless of the owner's exercise needs, however, the dog does need a walk every day. It is very suitable for living in an apartment.